A small profit with AUDUSD. Watching for the next opportunity. Last week, I entered a AUDUSD short position during the FMOC meeting. After the announcement, AUDUSD went down until Friday morning. I carefully counted the wave, and decided that it was not going to be an impulse wave. Besides, the news on Friday before the bell was about the financial over-haul bill becoming clear. I expected shorts to cover their positions and that is AUDUSD positive. So, I exited first thing in the morning with 72 pips, and that was a correct decision. 0.32% gain to the capital. Now I’m watching. I’m still holding on two both scenario that I had posted on June 16. The second scenario is favorable for the sellers, but I’d be careful. I will probably sell a small lot of AUDUSD along purple .B(.2) to blue underlined B. As you know, I made some money with short term long trade on gold, and I also have a mid term long position that is slightly positive. 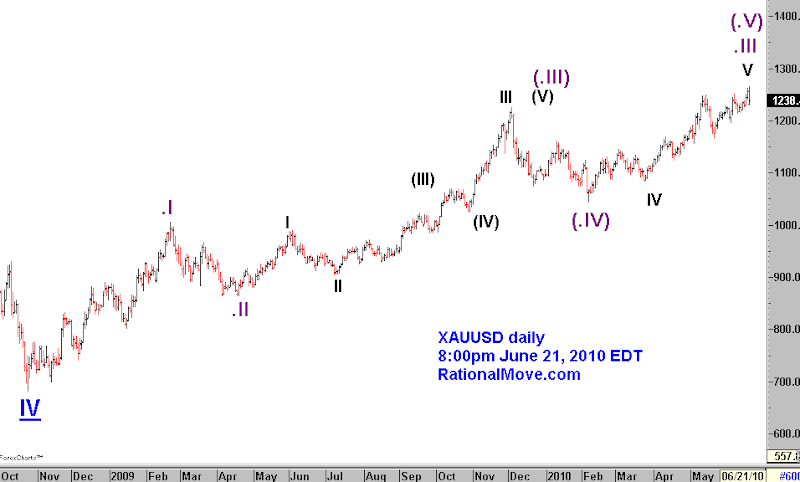 But looking at May and June’s gold sluggish move, I started to get very cautious. Frankly, I will be exiting mid term position at the next opportunity. It may extend the rally, but I want to be on the safe side. 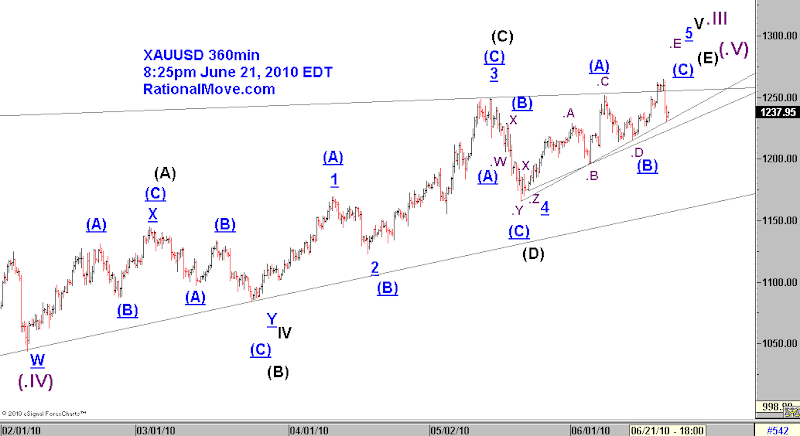 In either case, the last few waves look very much like ending-diagonal unless there will be a sudden rally like a rocket within a few days. Today’s fall rather looked very impulsive downwards, making me even more cautious. Again, the shape of the wave from purple (.IV) to (.V) looks non-impulsive. I have no emotional attachment to this market. I will be soon out of gold trade for the time being! It’s been 10 days since the last post, so I should post something. Frankly, nothing to say but I’m capital preserving mode. 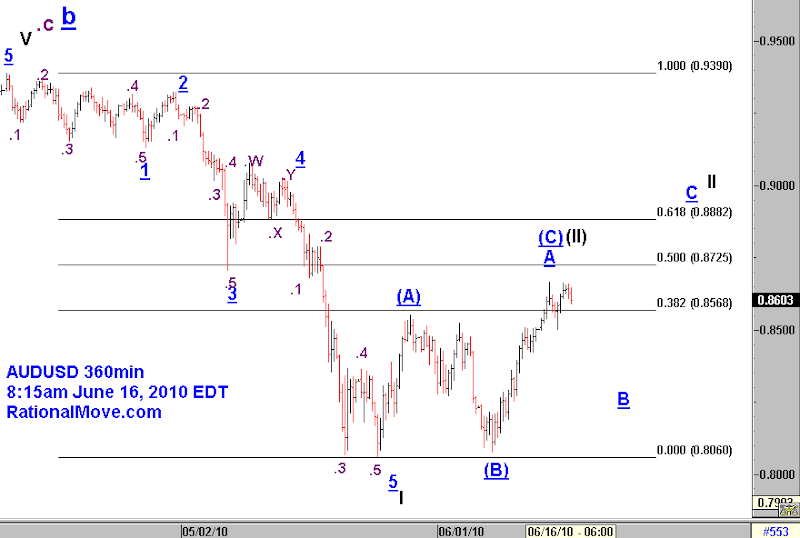 I was trying to figure out the Elliott wave count around May 6 flash crash. 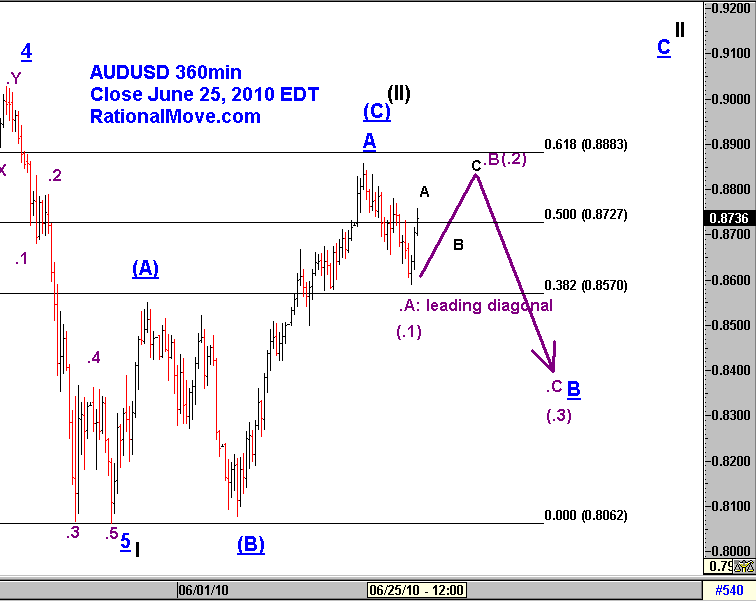 Below is my count of AUDUSD, May 6′s low being blue underlined 3. Although I did not upload, AUDJPY has almost the same count except that the blue underlined 5 is truncation for the JPY cross. 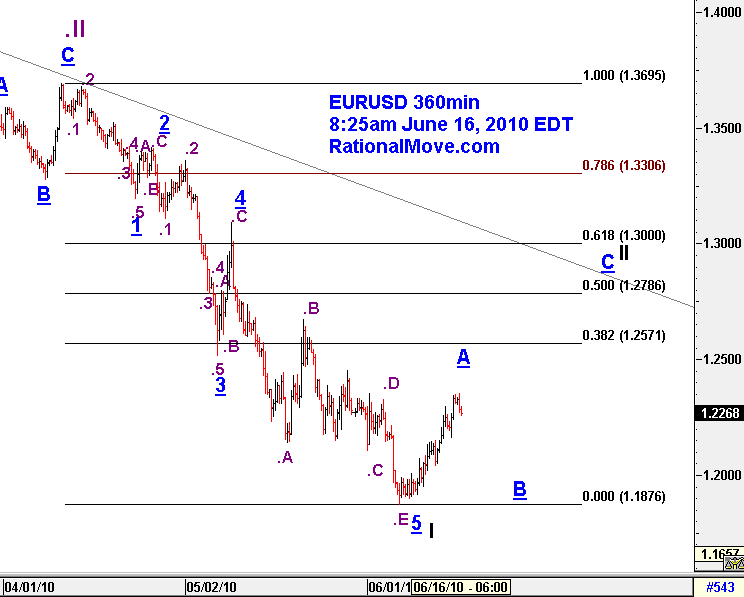 I don’t think EURUSD’s rebound is over. I expect the risk appetite comes back some more weeks, and shorts will continue to be forced to cover. So, USD and JPY (and maybe gold too) to give back more. That is my view.